"I'm looking for the tomb of Olivia Mariamne Devenish. It's located in Tanah Abang. Can you bring me there?" I asked the driver as I boarded his car. I showed him the name of the place, and he looked a little confused. "Hmm, Museum Taman Prasasti. I'm not sure where it is, but I know of two cemeteries around the Tanah Abang area. Shall I bring you there to have a look around?" replied the driver. I nodded my head enthusiastically and the driver turned the ignition key like clockwork, firing the engine up as he poised himself for our little adventure. East India House, Leadenhall Street, London. Circa 1817. Olivia Mariamne who? Better known as Olivia Mariamne Raffles, she was the first wife of our founding father, Sir Stamford Raffles. With only a few of her letters remaining, little is known of the Lady Governess of Java. Some historians have speculated that any remnants of her beloved's previous marriage may have been utterly destroyed by Raffles' second wife, Sophia Hull. Since I was in the vicinity of Jakarta, I decided to pay her grave a visit. However, it was a little more difficult than I thought. In a country where my command of the native language was tragic at best, it was like looking for a needle in a haystack. Long before he established a trading post on our sunny little island, Raffles was a clerk in the East India House - the headquarters of the British East India Company - in London. Raffles soon distinguished himself from the other employees of the company with his wit and ability. This was around the same time where he met the acquaintance of Olivia Mariamne Devenish. At that time, Olivia was a widow of her first husband, Jacob Cassivelaun Fancourt, an assistant surgeon in Madras who had died earlier in 1800. Soon after they met, Raffles and Olivia fell in love and got married at St George's Church in Bloomsbury, London on 14th March, 1805. Despite being ten years his senior, Olivia and Raffles seemed like a match made in heaven. fluttered proudly in all of the British Raj and Malaya. A mere six days after their marriage, the court of directors of the company deemed it fit for him to be posted to the exotic Prince of Wales Island (present day Penang) in the Far East and placed him under the tutelage of Philip Dundas, the Governor of Penang, as the assistant secretary to the Governor. Raffles was also given an exponential raise from £70 to £1,500 a year. The status of the Prince of Wales Island was on equal footing with three other great cities under the command of the British East India Company - Calcutta, Madras and Bombay. Detractors claimed Olivia Raffles was the mistress of Raffles' superior, William Ramsey, and in return for marrying her, Raffles was paid-off with a raise and a coveted post in the Far East, but this was fiercely disputed by those around the Raffleses. Despite these rumours, Olivia Raffles was highly regarded by many noteworthy people in the English and Malayan circles, receiving praise from the likes of Lord Minto, John Caspar Leyden (an English poet with whom Lady Raffles often exchanged letters and poetry) and Malay historian Munshi Abdullah. Soon after their marriage, Raffles set sail for Penang on board the Ganges in April 1805. In 1809, Raffles was transferred to Malacca to assume the post of Agent of the Malay states to Lord Minto, the Governor-General of India, due to his strong command of Malay, an appointment which he filled with much credit. The Resident of Malacca, the sixth at that time, was another well-known Englishman with ties to the early days of Singapore's history and none other than Major-General William Farquhar. The Chief Engineer of the expeditionary forces which wrested control of Malacca from the Dutch in 1795, Farquhar was appointed as both Resident and Commandant of Malacca in December 1813 and was in charge of both Civil and Military offices in the territory. After annexing the Netherlands as part of France's territory, Napoleon declared his brother, Louis Bonaparte, as the King of Holland. The British saw that as a legitimate reason to seize all Dutch overseas colonies, including the island of Java and the integral Dutch trading post on Batavia (present day Jakarta). There were a number of options discussed, including one minor attack on a Dutch naval base at Gresik, on the northern coast of Java. Eventually, Lord Minto decided that the British would invade Java to take possession of it. Old picture depicting Batavia in the 18th century. In June 1811, British forces deployed a fleet of Royal Navy ships to launch their siege on Java. As the agent to Lord Minto in the region, Raffles - aided by William Farquhar - played a key role during the Java Campaign, gathering information about Java and also making contact with the Javanese elite to determine how they would react when the British attacked. He was pleased to discover that the Javanese did not support the Dutch as the Governor-General of the Dutch East Indies - Herman Willem Daendels of the VOC (the Vereenigde Oost-Indische Compagnie or more commonly known as the Dutch East India Company) - controlled Java in a high handed manner and often subjected the local Javanese people to forced labour. *Fun Fact - The duit was a coin worth 2 penning issued by the Dutch during their colonial rule of Indonesia. However, usage of the term duit has spread to neighbouring areas such as Singapora and Malaya. The term duit henceforth became the official word for "money" in the Malay archipelago. This has since spread to the Straits Chinese community, where duit is pronounced as lui (Hokkien) and loei (Cantonese). The term Duit is also used informally in Indonesia, with Uang being the official word for money. During the Royal Navy's approach into North Java, the ships repelled Dutch fighting vessels and selected Cillingching (present day Cilinching, a northeast suburb of Jakarta) as the landing site after performing their reconnaissance. The ships arrived in the morning in Cillingching as planned and commenced with their unloading of the fighting force in the afternoon of 04 August 1811. In those days, there were no specialized landing crafts so the landing proceeded slowly with tender boats from the ships. As the landing was unopposed, all the forces landed without harassment that afternoon and the British began their march on Batavia.. On the morning of 08 August 1811, Batavia surrendered without a fight, and, by the afternoon, the British were conducting a formal takeover of the city from the surrendering Dutch troops. The invasion was a resounding success, and Raffles was unexpectedly named Governor-General of Java, a huge responsibility on the young man. The Honourable Mr. and Mrs. Raffles, as they were known at that time, installed themselves at the Governor-General's palace in Weltevreden, an European enclave on the southern outskirts of Batavia (part of "New Batavia" and known as Lapangan Banteng in the present day), where they were received with due marks of respect by the residents, who have been long oppressed by Dutch rule. Ironically, the area of Weltevreden was developed by Herman Willem Daendels himself before the arrival of the British. Daendels had ordered the destruction of the original city wall of Batavia to secure stones to build this new palace for himself on a square, which he named Waterloopein. The square not only accommodated the colonnaded Governor-General's palace at the north, but also a Catholic Church and the High Court of Justice Building. The Raffleses were not to stay in Weltevreden for long as they soon shifted to a palace at Buitenzorg (present day Bogor) for the greater part of their stay in Java, which Raffles himself considerably enlarged and beautified. The beautifully restored Buitenzorg Palace in Bogor. 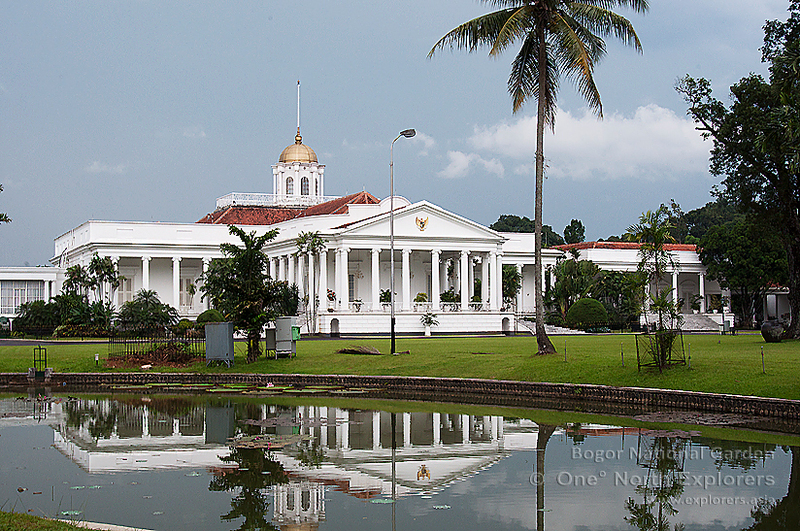 Today it stands as one of six presidential palaces in the Republic of Indonesia. Raffles began to dismantle the Dutch system of monopoly and forced labour and remodeled the judicial administration, introducing a jury system. He abolished the slave-trade, collected important statistics, and also travelled all over Java to gather information about the island's history, languages and products, always carefully respecting local culture along the way. Scientists were hired by the diligent Raffles to study the flora and fauna of Java and he made it a point to send specimens to London for further examination. An avid natural historian who founded the London Zoological Society, he has the honour of having a handful of plants and animals named after him, one of the most famous being the huge Rafflesia, a stinking bloom found in the rainforests of Indonesia and well known for giving off a strong odor of decaying flesh. Although Raffles had the choice to select British officials to help him manage the day to day matters of Batavia, he chose to retain several Dutch officials, all of whom served him to the best of their ability. The implementation of the British traffic system in Java, where all traffic is driven on the left-hand side of the road, is also often attributed to Raffles, who implemented the change during his tenure. Of course, there were also more political reasons for him to employ such a rule since the French Empire gave a huge impetus to right-hand travel in Europe. Hence, all the states that had resisted Napoleon kept left in an act of defiance. As the Lady Governess of Java, Olivia Raffles was ever-present by the side of Raffles at official occasions, such as visits at the native rulers. She was well known for hosting social receptions and parties for people from all walks of life, and was never known to reject even the common man on the street, a far cry from the previous administration where high society only mingled among themselves. The Java Government Gazette contained many accounts of several grand entertainments at which Olivia Raffles often scintillated as a hostess without equal. She spared people's feelings and in her position, she succeeded in performing her duties in such a manner to win the sympathies of all. Her natural sweetness and the charm of her personality did not fail to deeply impress those around her, and soon all the people in Batavia agreed that the new Lady Governess was the right woman in the right place. Despite her fairly high tolerance, Olivia Raffles disdained the chewing of betel nut and smoking among the ladies of the highest circles in Batavia so much that she ordered for all paraphernalia of betel-chewing to be banished from the palace at Buitenzorg. This "campaign" against betel-chewing and smoking evoked some passive resistance at first, but was soon dropped when the good intentions of the Olivia Raffles were felt by all the ladies of high society. Betel Nut Cutter from Bali, Indonesia. As the days gone by, Olivia Raffles' health grew weak as she could not stand the trying climate of Java. This was evident when she was not present at the ball in honour of the Prince Regent's (George IV of the United Kingdom) birthday in August 1812, nor were the races in Weltevreden on the same occasion graced by her presence. One of the last of the festivities of the year 1812 was a brilliant "public breakfast" given by one of the wealthiest merchants in Batavia - Timmerman Thyssen - for the glorious occasion of the renaming of one of his ships from the Pekin to Governor Raffles. The absence of Olivia Raffles was generally regretted by all who attended the ceremony and ensuing party at Thyssen's house, where most of the merry-makers feeling that the great evening party had been robbed of much of its glory by the absence of the Lady Governess. Not many could guess that Olivia Raffles was confined to bed by a fairly serious indisposition in the palace at Buitenzorg. She lay sick, very sick, wrestling in her weakness which increased in severity each passing day. Raffles, with the heavy burden on his shoulders, was overwhelmed by his duties over the next 2 years and found little time to devote to his wife. On the morning of 26 November 1814, darkness descended on Batavia as Olivia Raffles breathed her last breath, succumbing to the Malaria which she had fought off for so long. She was laid to rest at Tanah Abang Cemetery in Weltevreden and many wreaths were laid on her grave as a mark of respect for the Lady Governess. 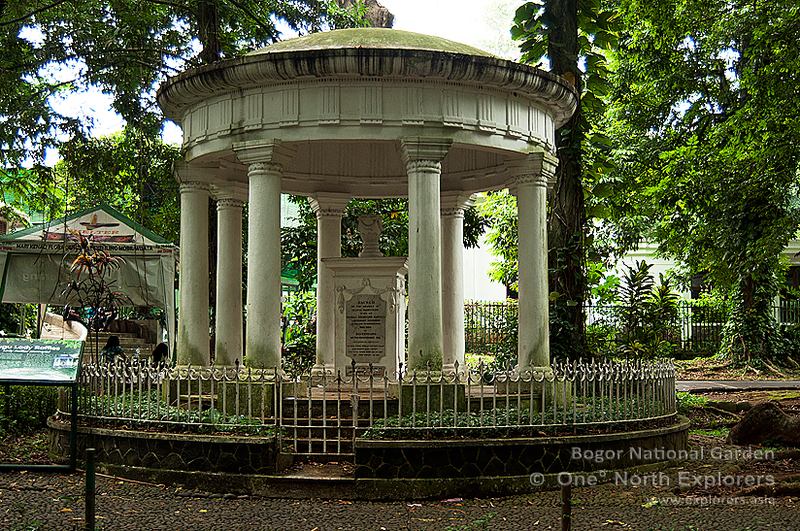 Raffles also erected a memorial in Buitenzorg to Olivia Raffles in a small garden which he first laid out with the help of botanists from London’s famed Kew Gardens. This same garden was then officially established by the Dutch in 1817 as the National Botanical Gardens under botanist Professor Casper George Carl Reinwardt. 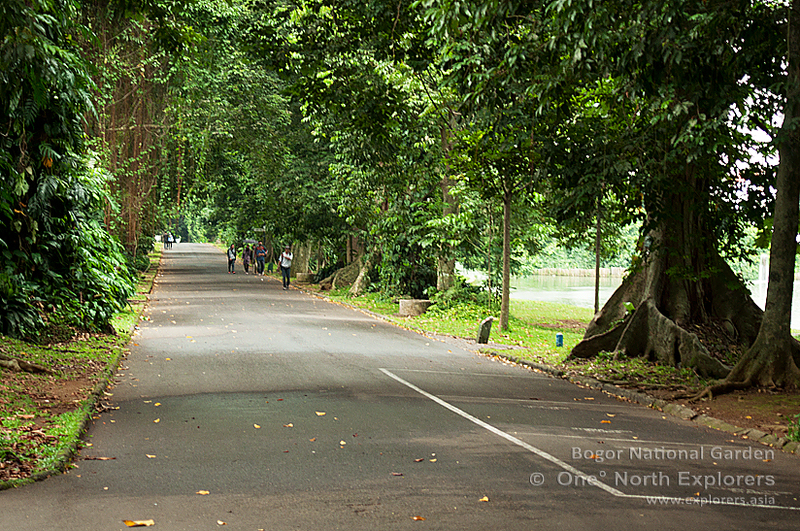 Today, it is known as the Bogor Botanical Gardens and the memorial to Olivia Raffles still stands strong along the Kanarielaan (roughly translated as "Canary Avenue"). The Memorial to Lady Raffles in Bogor Botanical Gardens was easy enough to find. Alas, this wasn't to be for the tomb that I was looking for in Tanah Abang. 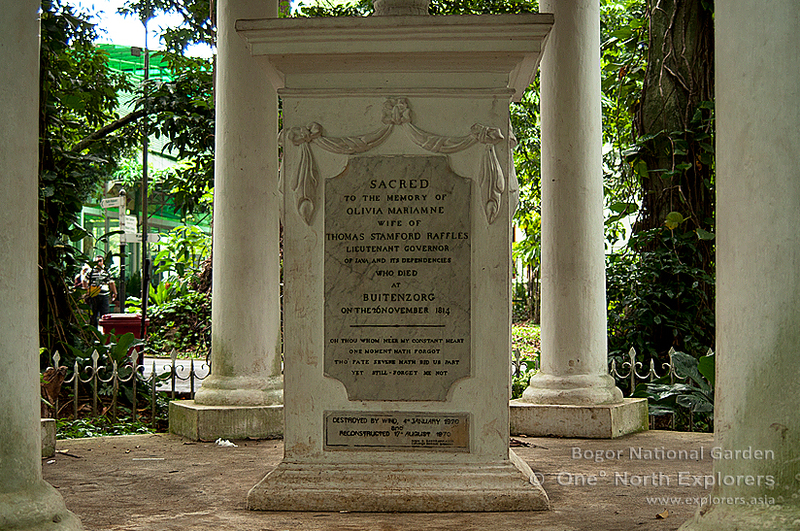 The tablet states the day that Olivia Raffles died in Buitenzorg - 26 November 1814. The Kanarielaan in the present day. The memorial lies to the right of this photo. On 11 March 1816, Raffles would return to England, handing over the reins to John Fendall, who was made governor of Java for the next five months before control of Java was restored to the Dutch. This was due to the Anglo-Dutch Treaty of 1814 which was signed in London, stating that the British were to return the colonial possessions of the Dutch as they were before the Napoleanic Wars. In return Dutch ships which were involved in the slave trade were no longer permitted in British ports. In the same treaty, the Dutch also ceded control of the state of Cochin in India in exchange for the island of Banca (present day Bangka) off the eastern coast of Sumatra. The last British governor of Java, Fendall handed over the island on 16 August 1816 after staunchly refusing to give up possession to the Dutch until orders came for him to relinquish his grip on the territory. Within the next two years, Raffles went on to marry his second wife, Sophia Hull, write and publish The History of Java* and be knighted by the Prince Regent . He would set sail in October 1817, spending a little over five months at sea and arriving on the island of Sumatra in the year 1818, taking over as the Governor-General of Bencoolen (present day Bengkulu, southeastern Sumatra). He would then travel to Malacca in late 1818 to survey the Riau Archipelago for a suitable place to establish a British trading post with the help of William Farquhar and go on to found Singapore, perhaps his largest achievement to date. *The History of Java - A book first published in 1817 and written by Raffles as a memoir of his tenure on Java from 1811 to 1816. In it, he describes the population on the island of Java, local customs, the geographical situation, agriculture systems, trading systems, languages and religions on the island of Java in vivid detail. He also tells about the traditional ceremonies conducted for welcoming a newborn, marriage, and funeral rites performed on Java since ancient times. Despite his short stay in Java, Raffles is still very much respected and revered by the people of Java and his names appears in Indonesia history textbooks alongside many other Dutch pioneers. Having problems trying to get anyone to understand that I was referring to him, I found out later that his name was pronounced as "Rah-Fu-Les" by the general Indonesian public. As we entered the Jakarta metropolitan area, the driver was explaining that the Tanah Abang area was famous for its textile market, and that he found it really odd for me to request for him to drive me to a cemetery in lieu of the usual requests from tourists to visit the Tanah Abang market instead. The peculiar name, Tanah Abang, may mean "Land of Elder Brother" or "Land belonging to the Elder Brother" in Malay, but the name of the place has a much deeper meaning than that. It is believed to have been christened by the troops of the Sultanate of Mataram, the last major independant Sultanate on Java. Sultan Agung Hanyokrokusumo, the ruler of Mataram, ordered a raid on Dutch-controlled Batavia in 1628 with a pincer-grab approach from the northern hinterland and the southern mountains. Locals believe that the Mataram troops came across the area of Tanah Abang during this particular campaign against the Dutch, and found it distinctive due to its red soil. As the word Abang means red in the Javanese language, they named it Tanah Abang (meaning red soil) and the name stuck since then. After a largely uneventful drive (except for one wrong turn, to which the driver made a hasty reversal from the minor road to the major road, much to my surprise), I arrived at the first cemetery in Tanah Abang. Stepping through the iron gates, I was greeted by a myriad of tombstones, each constructed in its own style. The innumerable sea of headstones came in all shapes and sizes, unlike the more-or-less standard ones we have in Lim Chu Kang. Some graves even have solid concrete shelters to shield visitors from both rain and shine! Notice the clothes hung out to dry in the background? I treaded around the cemetery cautiously, careful not to step on any of the graves as a mark of respect. There were many Chinese graves around the cemetery, all with inscriptions in English followed by supplementary inscriptions in Chinese. The Jakarta skyline acted as a majestic backdrop for the photographs of the tombs I was snapping. Here, away from the hustle and bustle of the busy city, the surroundings were calm. As I continued my stroll around the cemetery, I noticed that there were clotheslines full of clothing being strung haphazardly between some grave shelters. This was when I realised that the cemetery was a shanty town of sorts, and some homeless people have elected to make the place their home. Thankfully, despite my presence - a foreigner walking around taking pictures of grave must have been strange for some - they did not seem startled and carried on with their activities, washing, cooking and cleaning their area. In return for their apathy, I refrained from taking any photos of them or their makeshift homes. Most graves were well maintained, save for a select few. Apart from the squatters living in the cemetery, there were some men hard at work, digging a hole in between 2 old graves in preparation for a new burial. A grave usually is 1 meter wide, 2.3 meters in length and 1.8 meters deep but there are some families who require a deeper hole because they may want to bury another relative in the same hole later on, not unlike getting a larger niche in a columbarium for couples who wish for their ashes to be placed together. Stepping closer to look into the hole, I could see that the grave diggers were halfway done. There was a long hose lying nearby to the grave, a sign that the team had watered the soil to soften it before they started digging. Apart from their jobs as grave-diggers, these unsung heroes also double up their meager income by getting paid by families who opt to pay them in return for maintaining their relatives' graves. They certainly seem to be doing a good job as many of the graves seemed to be in mint condition. Are those leeks planted in this particular grave? A particular grave caught my attention as I walked amongst the headstones. It was a regular looking grace but with eight plants jutting out from the grass mound. With my limited knowledge of botany, I could only presume that these plants were leeks. The Chinese word for Leek sounds like "count" and is a symbolism for continuously having enough money to count (in other words, for a person to become and remain wealthy). The Chinese believe that the deceased (or their ancestors) will bless their descendants with good fortune if their graves are well taken care of. This is also one of the reasons why graves with good feng shui are highly sought after by the Chinese. Probably the relatives of the deceased occupant of this particular grave are hoping for wealth? Many graves here belong to the local Chinese, and the dates on the headstones vary greatly. Although this was a place of death, it certainly doesn't feel like such. The surroundings were so serene that you could just sit in one of the shades and whip out a book, or just enjoy some peace and quiet alone. Continuing my walk into the central part of the cemetery, I was astounded by a large mausoleum sitting proudly amidst the smaller gravestones. "Could this be the grave of Olivia Raffles?" I thought silently to myself. As I approached the mausoleum, I could hear loud chatting and laughter emerging from the mausoleum. I could not see who the boisterous ones were as I was approaching the mausoleum from the rear. As I circled the mausoleum, it was apparent that the chatter was from a rather large group. When the pathway leading up to the front of the mausoleum came into view, I could see many mountain bikes resting on the narrow pathway. It became clear to me that the people in the group were cycling enthusiasts who have elected to have a rest at the mausoleum in between their biking adventure. When I made my way into the mausoleum, I was greeted by about half a dozen smiling faces. I politely asked for permission to enter the mausoleum to have a look at it and the group didn't seem to be puzzled by my intention. "Many people visit this cemetery to take photos of the historic graves and this unique makam (mausoleum)." a mature-looking biker explained to me. I entered the brilliant dome-structured mausoleum and I couldn't help but be awed by the lavish marble used in its construction. When I approached the headstone, I was a little disappointed to find out that the occupant was not Olivia Mariamne Raffles, but a person by the name of O.G Khouw. The place was in a derelict state. The walls were scrawled with grafitti made with permanent markers, while the floor was full of caked mud and dried leaves. O.G Khouw, or Khouw Oen Giok in full, was one of the richest men of his era, as I found out later. He was a famous tionghua (local of Chinese heritage) who was a landowner with a vast sugarcane plantation. O.G Khouw had many achievements during his colourful life. He was the chairman of the Hospitaal Fonds "Jang Seng Ie", a hospital which is now known as Rumah Sakit Husada (Husada Hospital), and the owner of the"Kie Than Bank" in Jakarta. In 1908, he also allowed the conversion of his house along Jalan Pinangsia into the first Hollandsch Chineesche School (HCS) in Batavia. This was a school mainly for children of Chinese descent who were born in the Dutch East Indies. The HSC was part of the Dutch colonial government's efforts to establish Dutch as the main teaching medium as teachers in the HSC taught classes in Dutch, as opposed to the Chinese schools established by the Tiong Hoa Hwee Koan (The Tionghoa Association), where lessons were delivered mainly in Mandarin. The mausoleum, in all its splendour, was built with imported Italian marble, and houses the preserved body of Khouw, who died in 1927. The body of his wife, Lim Sha Nio, was added 30 years later when she passed on in 1957. The mausoleum was said to cost 200 thousand Dutch guilders when it was completed in 1910, an amount that surpasses the cost of the massive mausoleum which belongs to the ultra-rich Rockefeller family in Sleepy Hollow, New York. I made my way to the back of the mausoleum, where two symmetrical staircases led down on either side into the subterranean bunker, where the bodies of both Mr. and Mrs. Khouw were stored. I was immediately met with an iron gate blocking access into the bunker. Two grand black marble pillars flanked the bunker frame, and the beam running across the top was adorned with the words "Rust In Vrede", the Dutch equivalent of Rest In Peace. I could also see that putty was applied to the top right corner of the frame in a bid to restore the chipped off area. Not sure what that bright speck in the middle of the picture is. I'm guessing a falling leaf? Anyway, with the gate in place now, the couple can truly "Rust In Vrede". I found out that the bunker was previously accessible by anyone, but a Jakarta-based group of history buffs known as LOH (Love Our Heritage) have elected to install this gate in May 2010 after the media reported that the interior had been defaced by vandals and carved marble ornaments have been stolen. Some people have also been caught red-handed performing undesirable acts in the bunker, showing extreme disrespect for the deceased in my opinion. Visitors to the cemetery may only access the bunker now via the cemetery tour led by members of LOH now, a move which I emphatically applaud. By now, I knew that I was in the wrong cemetery. This cemetery (which I found out was called the TPU Petamburan Cemetery by the way) may be home to the largest mausoleum in Southeast Asia and the final resting place for O.G Khouw, but it wasn't the place I was looking for. I am still thankful for the unexpected discovery though. Making my way back to the carpark, I signaled for the driver to start the engine. I was hopeful. I still have another cemetery in the vicinity to visit. Crossing my fingers, I boarded the vehicle, optimistic that I would find Olivia's grave at my next destination. We're working on the second part of The Search for Olivia's Grave right now. Will we succeed in our mission, or be led on another wild goose chase again? Stay tuned to our site to find out! The One° North Explorers would like to thank Char Lee of Second Shot (http://2ndshot.blogspot.com/) for providing us with the precious lead to seek out Olivia Mariamne Raffles's grave. Do check out his blog for a great collection of photographs, historical anecdotes and most importantly, his impeccable precision photography! What a great post! I'm looking forward to the second part. Thank you for the encouraging comment, Flora! I will try my best to finish up part 2 of this post as soon as possible. When I first did some research about Raffles' first wife,I too wondered what her tomb look like today. But there are no pictures that I could find in books or the internet. Thus your journey of discovery and exploration makes very absorbing reading indeed. Great pictures and writng too. I'll await the 2nd part with bated breath. I'd just like to provide a little clarification. The piece above was actually written by me. Nonetheless, Char Lee - a valuable friend of ours - provided us with a priceless lead depicting the existence and location of Olivia Raffles' tomb to set us off in our journey of discovery. Of course, without Char Lee's help, the team wouldn't have gone off looking for this "lost" tomb in the first place. So I believe that he deserves more than a fair share of praise from all our readers who enjoyed this memoir. I'd also like to personally thank you, Uncle Yip, for your encouraging comments.Hearing these words coming from a well-respected pioneer of heritage and preservation such as yourself, makes me even more invigorated to to come out with more of such articles where readers of all ages can enjoy and embrace our little island's colourful history at the same time. Great write up and looking forward to the next chapter. Dear xtemujin, we're getting the second part ready as we speak and it will be up very soon. Thank you for your encouraging comments and I'm glad that you enjoyed our little memoir.